In this Blaze Build Guide, we provide an overview of his strengths, abilities, talents and matchups. Blaze is, without question, my favorite Hero in Heroes of the Storm. Like many, I've been waiting for "Firebat" for a long time. I'm incredibly pleased to see that he has not only arrived as an incredibly enjoyable Hero, but without doubt one of the strongest Warriors in the game. While it's perhaps early to make such a statement, there's no denying the potency of Blaze's kit. While most warriors have crowd control, mobility or utility, Blaze has all three, alongside a considerable amount of damage, sustain and wave clear. Not only is he incredibly comfortable at holding a lane by himself, but he's also formidable at trading 1 on 1 thanks to his self-healing when in amongst his fire. What's so potent about Blaze is that his area denial, combined with self-sustain and damage ensures he can be comfortably drafted as a solo Warrior, or duo. 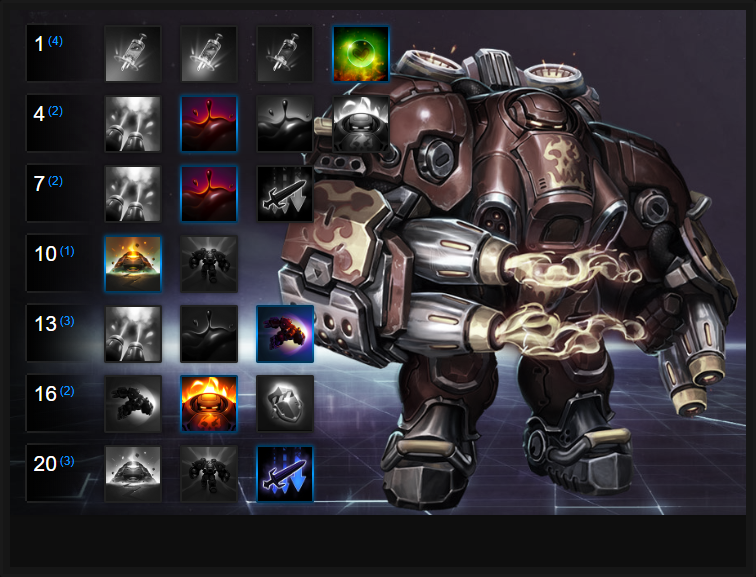 In many ways, he surpasses the likes of Muradin or Diablo simply because his kit is so bloated. Although Support Heroes can mitigate much of his damage over time, his ability to disrupt and continually apply team-wide pressure when fighting over objectives. Although Blaze is heavily reliant on his Oil Spill to heal himself, and deal damage over time, he can still excel without both. The fact his basic attacks cleave, while his Jet Propulsion causes a stun, still affords him plenty of utility. In the right hands, he's an incredibly fun and powerful Warrior. Pyromania (Trait) - Pryomania is a long cooldown Trait that allows Blaze to instantly gain armor. Those around him suffer damage, and in the process, Pyromania's cooldown is lowered. The 25 armor is significant, and its duration fairly long. While it won't keep you alive under focused fire, it will allow you to reduce the damage you receive making life that much easier for your Support. Ideally you only want to use Pyromania when in amongst the enemy team, so that when it does deal damage you can use it again that bit quicker. Flame Stream (Q) - On a short cooldown, Flame Stream is cheap on mana and fairly good on damage. It cleaves through enemies, allowing you to soften a minion wave easily and deal damage to multiple Heroes. Without Talents, it's your only ability that can set Oil Spill alight, so you need to ensure you always have it ready when you want to bombard an area. Considering it's range, you can afford to poke a little with Flame Stream before charging in with Jet Propulsion. At the very least, using it from maximum distance will threaten the opposition or harm a stealthed Hero. Oil Spill (W) - I'll freely admit that Oil Spill is pretty challenging to use. You not only have to aim the direction you want it to land, but also how far. It also has some quirky interactions with scenary that can result in the Oil Spill changing direction. That said, with practice you can reliably place Oil Spill where you want it, in order to pressure the enemy team or to zone an area. With two charges, you can comfortably dump both at once for maximum effect, or stagger them to ensure you've always got access to your healing. Just be conscious of the fact Oil Spill when ignited loses its slow component, but heals you in return. Try to stand in it and don't ignite it just for the sake of it. Jet Propulsion (E) - Your only form of mobility and crowd control, Jet Propulsion acts similarly to Varian's Charge. Stunning any Heroes he hits, and those around the target, it's incredibly important to ensure you hit an opponent. Alternatively, if you are retreating with it, be sure to take into consideration the wind-up time. You can be interrupted during it, preventing you from leaping forwards. I'll also add that hitting the front-line with Jet Propulsion is never a bad thing, as it still ensures you can lay down your Oil Spill or start your Trait. Bunker Drop (R) - Bunker Drop allows Blaze and his team to dive into a stationary location to protect themselves. The bunker has reasonable health and allows allies to fire from it. It takes a fair amount of damage from the opposing team to destroy the Bunker Drop, and once players do exit it, they get to choose where from, with a +25 armor bonus. Considering you can lock down an area with Bunker Drop, or go into it when low health, it's incredibly powerful especially when fighting over an objective. Combustion (R) - A particularly aggressive Heroic that works well in confined spaces, primarily over an objective, Combustion is a high damage AOE ability. Although it can last up to 5 seconds, its damage over time and slow is based on its total charge. In most instances enemy Heroes can escape it fairly easily. However, if they're slowed with Oil Spill or trapped by your own team, Combustion can do massive damage. By default Blaze has no access to Unstoppable, so relies on New Habits to ensure he can maintain his movement speed, while triggering his Trait. New Habits needs Blaze to collect just 15 Regeneration Globes to reduce the cooldown of Pyromania by 5 seconds and to gain Unstoppable for 2 seconds. Variable: If you have a Support who can regularly provide you with Unstoppable, pickup Neural Stimpack. It provides you with a buff that reduces your cooldowns by 100% for 5 seconds, allowing you to use your abilities much more often in a team-fight. Adhesive Petroleum allows Blaze to retain the slow effect of Oil Slick even when it has been ignited. Not only does the slow effect keep enemy Heroes trapped near you for longer (especially if youve used both charges of Oil Slick), but its duration is fairly long at 2.5 seconds. Grill and Kill is a Quest Talent that after your Oil Spill hits 60 Heroes, increases the size of Oil Spill by 20% and its duration by 2 seconds. For zoning, and controlling an area, it's brilliant. Variable: Flame Stream isn't always available for Blaze when his Oil Spill is, so having your basic attacks ignite Oil Spill ensures he can always heal himself, or burn his opponents. Incinerator Gauntlets not only plays into later Talents, but also increases the attack area of his basics by 15%, and the damage he deals to Minions, Mercs and Monsters by 50%. Grab this if you're in Quick Match, or with a team who refuse to soak/take camps. Bunker Drop is an exceptional Talent that buys Blaze time, allows his team to lock down an area, and escape when neccesary (especially if they aren't surrounded). As long as your team dive into it in order to use its protection, you should always win on sustain. Grab it on Battlegrounds where you have to fight in one place, over an Objective. Fuel Leak allows Blaze to cast Oil Spill as he travels with Jet Propulsion, while he also causes an Oil Spill on target impact. Combined with your basic attacks which cause burning, you can then instantly ignite your location without having to use Flame Stream. You're then free to use Oil Spill > Flame Stream for a double combination of burning, self-healing and slow. Heat Treatment provides a heal to Blaze based on 75% of the damage he deals during his Trait. If you're in amongst the enemy team, especially after Jet Propulsion and when right on the front-line. Allowing Blaze to slow enemies with his basic attacks, Burn Notice also provides him with a damage over time component that stacks, for each attack he lands. Combined with the DOT damage from an alight Oil Spill, it can make Blaze a real threat when in amongst a team. Variable: If you took Bunker at 10, Fortified Bunker at 20 is great for late-game sustain. It significantly improves Bunker Drop, allowing those inside to cast Oil Spill (while also spewing fire) while also increasing exit armor to 50, from 25. Better still, the armor duration increases by 1 second. This list of tips and tricks are just a handful of things we think will help your Blaze play. We'll continue to add to the list as required and if you have any tips you'd like to share, let us know in the comments below and we'll place them here. 1. Don't ever waste your Trait just for a 1 on 1 fight. Unless it can gaurentee your survival, and/or a kill, it's simply not worth it. Save it for a team fight where you can maximize its damage and cooldown reduction. 2. When your Trait is active, it can be boosted further by additional armor effects. Heroes such as Uther can instantly increase it to 50 by healing you when it's on. 3. There's little complexity to Flame Stream. It's a double-line telegraph on a low cooldown, that's cheap on mana, which deals damage. Use it often, even if you've no oil to ignite. 4. Try to always have Flame Stream ready for when you want to spike with Oil Spill. Until level 13, it's the only thing that will set the oil alight. 5. Oil Spill lasts for 5 seconds. Don't feel the need to set it alight instantly. Just using the slow, or the threat of burning the enemy can often be enough. 6. Oil Spill heals Blaze for a significant amount. Always have one ready, and be sure to either stand in it, or cast it at your feet so that you mitigate incoming damage. 7. Oil Spill takes some practice to use properly, as you have to choose the direction it faces and the distances. Hit Try Mode to practice using it without cooldowns. 8. Try to use Oil Spill in choke points, or directly on an objective (such as Cursed Hollow). This'll zone the enemy and allow you to keep them slowed, even if you don't ignite it. 9. Use Oil Spill to retreat if your Jet Propulsion is on cooldown. Lay it in front of you as you run away to deny enemies the opportunity of following you. 10. Jet Propulsion is invaluable for peeling for an ally. Use it to save a team-mate who's under pressure. 11. Ideally you should try to aim for a Hero in amongst the enemy team, with their allies next to them. That way, when Jet Propulsion lands, you'll stun all those around you and can then instantly trigger your Trait. 12. Bunker Drop has a really short cooldown. Don't worry about using it often, as it'll soon be available again even when destroyed. 13. You can choose where to exit from your Bunker Drop. Use this to escape, or engage in the right place. Thanks for reading our Blaze guide! You can now help support Ten Ton Hammer, so we can keep writing guides like this. Thanks for reading our Blaze build guide. You can help support its updates by subscribing to Ten Ton Hammer. Here's the details.